When I first learnt to crochet I was given this book as a Birthday present and struggling through the sometimes erratic patterns has taught me a lot about crochet over the years. 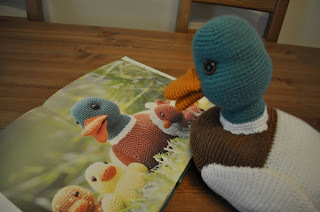 One of the first things that I made were two of the sweet little ducklings from the duck family pattern and these little guys with their wings that look like floats (as shown in the photo on the right) were so well received that I ended up sticking with crochet instead of doing more knitting. Frank the duck was made much later on, for my husband who for some reason fell in love with the idea of having a crocheted duck. This book is aimed at both beginners and more experienced crocheters so it has a large range of projects with different levels of difficulty. There is the usual short glossary of stitches at the beginning of the book which also has some very clear black and white diagrams. 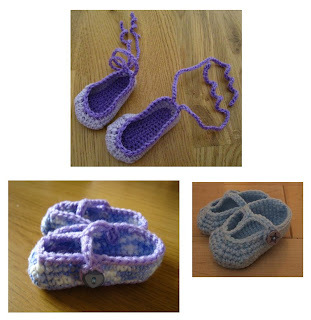 The projects include patterns for scarves, hats, baby and young children clothes, some rather odd 'for the home items' as well as some lovely crochet toys. 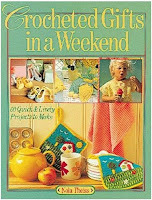 There are still projects in this book that I mean to get around to making one day, and even though this book is getting a little dated now (it was originally published in 1995) most of the patterns still seem appealing. The booties that I always seem to be making are also from this book and are pretty quick and easy to do. After having made a large number of pairs I now find the pattern easy to follow, but some guidance about where to place stitch markers would have been useful first time round. All in all this crochet book will always stay a firm favourite with me, but before you rush out to find a copy for yourself remember that this isn't necessarily the best written book out there and I have found a number of errors in some of the patterns that I have had a go at. If anyone else has a copy of this I would love to know what you think and perhaps see some photos of what you've made - I seem to be the only person on Ravelry who has photos up of what I've made from it! I've been crocheting for almost a year. I wanted a hobby and after reading this I have realized that I have yet to own a patten or any sort of crochet book. Just thought I'd share. I wish I had books like that. The duck is really cute by the way. Thanks Melissa - no crochet books yet or even any patterns yet - wow! I love to follow patterns and through using them over the years I've learnt a lot about crochet. There are loads of free patterns out there though so if you can't afford any new books then be sure to try some of those, I've got so many things queued on my Ravelry list that I will be busy for many years to come! That duck is full of character! He looks like he'd get up to some interesting adventures.